"Powerful, versatile and modern personal email client"
Chances are you know one of the major browsers called Firefox, offered elsewhere on Winportal. Well, here we present an email client, called Mozilla Thunderbird, from the same company. So, you might want to see why this is considered one of the best alternatives for Microsoft Outlook. Now it is even easier to get started with Mozilla Thunderbird as it comes with a migration assistant and a mail account setup wizard, a one-click address book, an attachment reminder and an activity manager. 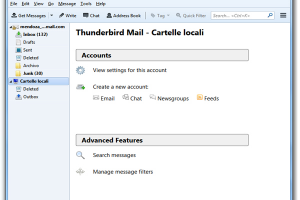 Thunderbird furthermore features tabs and search, a quick filter toolbar and a message archive. This email client enables you also to customize your email experience. As such, you can skin it's look and feel, there are smart folders and an add-on manager. To finalize the round-up of Thunderbird's features, it is secure and protects your emails, cutting out the junk, offering robust privacy, phishing protection and automated update. So, here you have an open source development, free to use and tailored to modern personal email management needs. As such, you can easily manage multiple email accounts, open emails in several tabs, customize and extend this modern and powerful email client via a wide variety of plug-ins.